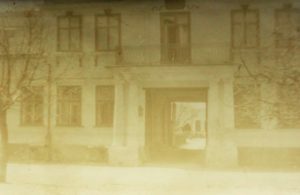 The building which is home to the Maria Konopnicka Museum is one of the most fascinating architectural works in Suwałki. It was built between 1826 and 1827, but obtained its final form, which has survived almost unchanged to this day, from 1835 to 1836. The architecture alludes to the manor houses favoured by the nobles and landed gentry. A one-storey building with a functional attic space, it is three-sided, with the main section facing onto the street and the two side wings running towards the garden. It was built using bricks and is sheltered by a gable roof. The central section features an entryway. 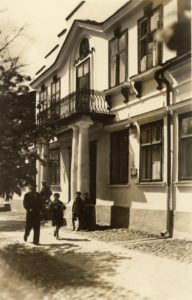 In the days when Maria Konopnicka’s parents, the Wasiłowskis, and their family lived in Suwałki, it led to a courtyard. Nowadays, it constitutes the hallway of the museum, separating the building into two parts. The front of the central section features a structure like an extended dormer window, but with four windows and a door leading onto a balcony. That entire structure is crowned by a stepped attic. Two columns adorn either side of the entryway and support the balcony above it. Each of the four windows has a sculpted lion mask above it and there is an oval medallion over the door opening onto the balcony. When the Wasiłowskis arrived in Suwałki, the building belonged to a notary by the name of Jan Zapiórkiewicz. At that time, it was divided into three flats, two on the ground floor and one in the attic. To begin with, Maria Konopnicka’s parents took on the one under the eaves. Later on, they moved to the ground floor and, for a while, they made their home in the other two.